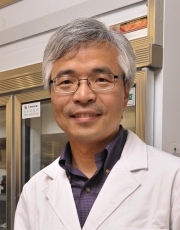 Prof Mingjie Zhang received his PhD in Biochemistry from the University of Calgary in 1993. He worked as a postdoctoral fellow at the National Cancer Institute of Canada before joining HKUST in 1995. He is currently Kerry Holdings Professor of Science of the Division of Life Science at HKUST. Prof Zhang's research focuses on molecular mechanisms of organization and regulation of neuronal signaling complexes and machineries in controlling cell polarity by using protein crystallography and NMR spectroscopy. He has published extensively in the leading journals including Science, Nature Structural Biology/Nature Structural & Molecular Biology, EMBO Journal, etc. In 2002, he won the Outstanding Overseas Young Scientist Award by the National Natural Science Foundation of China, followed by the Croucher Senior Research Fellowship in 2003. He also snagged the Second Prize of the State Natural Science Award in 2006 and the Ho Leung Ho Lee Foundation Science and Technology Advancement Award in mid-2011. He has served as an Advisor on the Overseas Scientific Evaluation Committee of the Chinese Academy of Sciences, as well as Reviewer, Editorial Board Member and Director to a number of international journals and academic institutions. He is also a founding member of the Academy of Sciences of Hong Kong. He was elected to the Chinese Academy of Sciences in 2011. Lorenzo, D., Healy, J., Hostettler, J., Davis, J., Yang, J., Wang, C., Hohmeier, H., Zhang, M. and Bennett, V. (2015). Ankyrin-B metabolic syndrome combines age-dependent adiposity with pancreatic β cell insufficiency. Journal of Clinical Investigation, 125(8), pp.3087-3102. doi:10.1172/JCI81317.